Vacuum sealed what’s that? lol. Extra credit for thinking a bit outside the box with the form factor. I wonder how many of these things exists total? Probably above 100 but below 1000? I can see them becoming coveted diamonds in the rough as future generations become less interested in N64’s. This is pretty awesome. Looks a lot smarter than some of the other N64 mods out there. 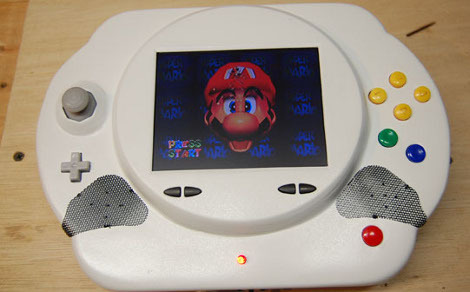 Ok, now I am not loving the portable N64 mods so much. How many have there been now? kinda looks like a fried egg with marios concerned face on it. @Stuart: it’s hard to make them small though. All the boards are already large, so making a smaller board would require a lot of circuit work by hand. There is a lower limit though – if you want to use the original hardware, you are (mostly) constrained by the size of the motherboard. Maybe one day the schematic will be released and someone will come up with a smaller board layout? THAT would be an awesome hack. Oh come on!? Just another Nintendo mutant? Those console mods over and over again are boring me. Congrats CD! Glad to see this on Engadget too! I wonder if guys on hot-rodding sites have like that ONE guy who complains that someone has taken another car and customized it it be cool and unique? Do you think those guys come off as a douche to those guys too? if you don’t like it don’t read it. This looks cool to me my n64 power cord broke and I have like 14 games ): but any way I would pay for this anyone else? What would be nice if one of these modders that use these custom made cases actually got a bunch made and sold them. While I don’t care that much for a portable N64 I’d be more inclined to do one if I had a case for it. This is actually one of the more genius designs i have seen so far. I haven’t seen too many PS1 mods actually now that you mention others. PStwo would be a nice target as well, with an SSD perhaps if you wanted to use an emulator for your old games as well, or back current disc games on to the drive to save having to carry 50 discs everywhere with you. Hell, you wouldn’t even need to mod much, just slide it in a case and plop a screen on it, PStwo is already tiny as it is. The N64 games I own are sooooo much better than anything for the NDS that I inherited. I don’t know about PSP games though. But other than the Pandora, this is probably the best handheld game console out there.